Larry began by asking Professor Shakhashiri about his upcoming Christmas Lecture, which will be the 40th anniversary of “Once Upon a Christmas Cheery in the Lab of Shakhashiri.” Professor Shakhashiri began his Christmas Lectures to carry on the tradition of the great British chemist Michael Faraday who, in the early 1800s, gave very popular Christmas lectures at the Royal Institution in London. The 40th Anniversary Christmas Lecture will be offered four times; twice on December 5 and twice on December 6, in Professor Shakhashiri’s chemistry lecture hall (capacity 360). The shows are recorded by Wisconsin Public Television which shows them during the holiday season and provides a version for use by all public television stations in the U.S. at any time. Professor Shakhashiri said anniversaries are times to reflect, and giving the Christmas Lectures has been a great privilege, “my holiday gift to a wonderful community.” Professor Shakhashiri also noted the passing of a colleague, Dr. Glen Dirreen, at age 75. For many years Dr. Dirreen was involved in the Christmas Lecture and was director of General Chemistry Labs at the University of Wisconsin-Madison and associate director of the Institute for Chemical Education when Professor Shakhashiri was director. 1. Transforming the lowest-performing schools. Professor Shakhashiri said Wisconsin has some excellent schools, but also some troubled ones, including the largest, Milwaukee. 2. Use timely information to improve teaching. Professor Shakhashiri said research has shown better ways to teach. 3. Support outstanding teachers and principals. Professor Shakhashiri said local governments and school districts as well as the federal government should reward good teachers. 4. Enact higher standards and better assessments to prepare students. Professor Shakhashiri said he agrees with all four. While good teachers should be highly valued, he said salaries should not be measured by grades. Testing is needed, he continued, but too much reliance on standardized testing can lead to teaching to the test. Test scores are a telltale of academic progress, but they are not everything, he continued—what’s important is to have an environment conducive to learning. Professor Shakhashiri is hopeful that society can respond to the President’s call, but he can’t do it alone. Reform must be backed by everyone, including colleges and universities as well as businesses, Professor Shakhashiri continued. “Education is the key to success,” he said. “Ignorance is our worst enemy and high quality education is the solution.” Professor Shakhashiri said he’s greatly encouraged by the President’s visit to Madison and hopes it inspires all of us to do more than we are doing now. Larry asked about the National Science Foundation. NSF is a federal agency which has been the largest source of research money for universities, but its percentage of the costs is dropping. Professor Shakhashiri noted that the University of Wisconsin-Madison is the highest ranking public university (and third overall in the latest report) in getting federal money for research, and he said that’s a tribute to the faculty and the students. The federal government has a major role in funding research, he continued, but there is also a lot of support from corporations and private foundations. Support for all levels of education should be sustained from all sources, he said. A caller said holding school year-round should be considered. The caller asserted that public schools effectively shut down in mid May in anticipation of summer vacation, and that the first month back, September, is devoted to getting students back to the level they left off in May, resulting in a four to five month gap in learning. He said schools are paying fixed costs the whole time. Professor Shakhashiri noted that we have public school only 180 days a year (that’s the law in Wisconsin, and it’s similar in other states.) This is a vestige of an agrarian economy, he continued, and all classroom programs and schedules should be re-examined. “Learning takes place everywhere,” he continued, “but in classrooms, students should learn how to learn—they should learn critical thinking and how to enjoy learning.” Most people learn most of what they know outside the classroom, Professor Shakhashiri said, but school is needed to acquire good learning skills and to become enlightened. He said there’s nothing magic about the 180-day school year, or college and university calendars which typically have two semesters and a summer school. He added that there’s also value in having a break to allow for other experiences, but that we should think seriously about possible changes. Another caller refuted the assertion that schools effectively shut down in mid-May. The caller identified himself as having been a teacher for 15 years and a school administrator for 15 more. “Shutting down in May couldn’t be further from the truth,” he said. Teachers feel they do not have enough time to cover all the material as it is, and the last thing they want is a room full of students with nothing to do, he continued. The caller asserted that people say whatever they want without any knowledge or data, and is up to everyone to challenge false assumptions. Professor Shakhashiri said this call shows how we educate each other with discussions. Free speech is good, he said, but we should be informed about what we say. He noted that in his freshman lecture section of 360 students, each semester ends in a crescendo rather than fading out. The caller continued, saying that every time education is mentioned, it goes back to more money, and the more money we spend, the worse it gets. Professor Shakhashiri said student performance is what it’s all about, not performance on a test but long-term performance in life. He agreed that throwing money at the problem won’t solve it, but said we must understand what the problem is to begin with, and that solving it is the responsibility of everyone. Professor Shakhashiri continued to advocate for parental involvement in education and said there’s a lot of research that shows that some teaching methods are better than others and that educational progress will be influenced by the research. A caller said her daughter is attending an on-line charter school, the I.Q. Academy. The caller said learning is self-paced--more like a real job and more like reality. The curriculum includes some live classes, she said, and her daughter gets more help and individual attention than she would get in a traditional school. Professor Shakhashiri said the school sounds good, and the caller’s report is in line with what he knows about such schools. But he said while electronic communication is helpful, it’s not a substitute for personal interaction. The caller said her daughter feels more connected than she would at a brick and mortar school, has more time to volunteer in the community, and does many other things. Another caller said she does not know how to help her children with school work, and urged more school interaction with parents, suggesting regular meetings between parents and teachers to discuss course content and education. She said schools don’t engage in enough activity with parents, but should be partners with parents. Professor Shakhashiri agreed, and asked the caller if she’s discussing her concerns with friends and neighbors. The caller said she hadn’t thought about that. Professor Shakhashiri encouraged her to enlist others to pursue her goals, noting that she took the first step by calling in. Larry began by noting an important anniversary for Professor Shakhashiri, the 52nd anniversary of his arrival in the U.S. from his native Lebanon. His father, a public health physician, came to Harvard as a visiting professor and expected to stay just one year. Professor Shakhashiri said it was a day of nostalgia, and that he’s grateful for the hospitality and great opportunities offered by the U.S. “Every time I return from an overseas trip,” he said, “I fall on my knees and give thanks for being in the United States.” The U.S. is a great county, he continued -- not perfect, but with a great environment that promotes learning. The University of Wisconsin-Madison is a citadel of learning, he added, respected worldwide. To celebrate his anniversary, Professor Shakhashiri provided cake the day before to all 360 students in his beginning chemistry course. Professor Shakhashiri has taught introductory level chemistry and other courses during his 40 years at UW-Madison. The new academic year has just begun at UW and Professor Shakhashiri is giving the first exam of the semester at the end of the third week of the semester. He’s now giving five exams a semester instead of three to help students focus on their work and make the transition from high school -- 80 percent of his students are freshmen. Professor Shakhashiri publishes an extensive guide and syllabus for the course, which can be found on this web site, to help students prepare for every lecture, discussion and lab session. He encourages students to study in co-operative learning groups of four or five, and to devote two hours of study for every hour spent in class. He also asks students to take an hour every weekend to reflect on what they learned during the week, write down their reflections, just one page or so, and send them to him. He said that the week before, more than 200 students sent him their reflections. Professor Shakhashiri said that, over the years, many students have told him that their parents have put undue pressure on them to get good grades. He said that as a parent he understands the desire for excellence, but that grades, while important, are not everything. He called on parents to be more comprehensive in their expectations and not berate students when they don’t receive an A in every course. The purpose of a course is to learn the material, and to learn how to learn, he said, and he urged parents to be compassionate and promote learning. Larry asked about the need for more public school teachers, noting a news report that the Baltimore school district has hired some 600 teachers from the Philippines. Professor Shakhashiri said America is the land of opportunity, and the reliance on overseas teachers indicates that native-born Americans are not going into teaching in sufficient numbers to meet national demands. Other districts have also looked overseas for teachers, he said, and there’s a need to develop teachers within our own society. There are more than three million teachers in the U.S. and the turnover is high due to retirements and people changing careers. We need good teachers at ever level, he continued, who are committed to their profession and to the subject matter. Professor Shakhashiri noted a proposal he made last spring (see the first bullet point on page 3) to recruit and maintain 200 teachers a year to go into the Milwaukee Public School district which, like many large city districts, has a high dropout rate and poor student test scores. The teachers would get scholarships for their education and then have a five-year obligation to teach in the Milwaukee schools. Professor Shakhashiri challenged all leaders of society to care about inner city schools. This is not to say there’s no need in rural areas, he continued, but inner city schools need help the most. A caller said her son attends the UW-Madison and has a teaching assistant who is abusive to students. She asked what training T.A.s get. Professor Shakhashiri said he has eight teaching assistants for his lecture of 360 students and that he meets with them every week. In addition, incoming graduate student assistants get an intensive one week orientation session before the first semester which includes mock discussion and lab sessions. “We are dependent on graduate students,” he continued, “and it’s a great system because the graduate students are not much older than the undergraduate students and can understand their problems.” Professor Shakhashiri said the training focuses on improving interaction and developing more patience among the assistants. The system is not 100 percent successful, he continued, and he welcomes comments from parents and students. However, he noted that it’s up to the student to take advantage of the University’s resources by seeking advice and counsel. Another caller noted reports that some international organizations won’t hold conventions and other meetings in the U.S. because of problems with members getting visas. Professor Shakhashiri said some organizations he belongs to, including the American Chemical Society and the American Association for the Advancement of Science are concerned, and have their own international activities offices to deal with the U.S. State Department to help visitors. This is a situation that won’t go away, he continued. Scientists from all over the world have been denied visas, and this is contrary to what our country is all about. It takes a lot of effort to get visitors approved in time, he said, but the organizations have had some success. “Openness is vital to science,” he said. Another caller, identifying herself as a 1974 U.W. graduate in nursing with advanced degrees, said that when employees reach the top of their pay scales, hospitals fire them and hire new nurses from the Philippines and Thailand, which is a double loss, for both the home country and the U.S. Professor Shakhashiri said he wants to leave the door open for legal (not illegal) immigration because immigrants enrich us. It’s important to be open and hospitable, he continued, but not at the expense of ourselves or others. Another caller, identifying himself as a retired professor, noted that when he was an undergraduate, all of the teaching assistants were native English speakers, but that now many T.A.s have a language problem. He said students have often reported problems with understanding T.A.s and that there seems to be no training or selection process. Professor Shakhashiri said the profile of students has changed with many fewer now that are native-born. He said there are screening processes and that his own T.A.s know the subject matter well and are willing to listen to advice, such as to speak more slowly. “By and large, we are successful,” he said, “but there have been cases where T.A.s have not been fluent enough and changes have been made.” He urged students to take responsibility for their education and talk to their T.A.s or professors during their office hours. Another caller identified himself as a nuclear engineering major who took Professor Shakhashiri’s chemistry course six years ago. He said that during his undergraduate engineering career, about 90 percent of T.A.s were foreign born, and that half the time he had a lot of trouble understanding them. This was a real hindrance to his education, he continued, and he had to learn on his own. The caller added that he would have liked to go to graduate school, but that the competition is so intense he had no chance of getting in. Professor Shakhashiri said he is always glad to hear from a former student, and agreed that there has been an increase in foreign born graduate students. This is a good thing in one sense, he continued, because science is international, but that schools should be concerned about the overall quality of undergraduate education. He also noted that T.A.s are assistants, not the main teacher, and that students should seek all sources of help in learning. Larry noted that the WISL corps of undergraduate student chemistry demonstrators will be providing a hands-on exploration station at Villager Mall in Madison every third Saturday, starting this week (some of the undergraduate Science is Fun demonstrators are foreign-born). And Larry noted that WISL sponsored a lecture that evening (September 17) on Science and Religion, featuring UW-Madison philosophy professor Seven Nadler. WISL is sponsoring several programs on science, religion and ethics. Professor Shakhashiri said science and religion are the two strongest forces in society and their interaction needs to be explored. Larry began by noting that the next Sunday is Father’s Day in the U.S. and also June 21, the first day of summer in the northern hemisphere. Professor Shakhashiri wished all fathers and grandfathers a happy Father's Day, and wondered if people know why we have four seasons in the temperate zone. Learning about natural events, he said, is part of being science literate. Professor Shakhashiri often asks people what causes the seasons and he asked listeners to call in with their answers. Larry also noted that the biggest fireworks display in the Midwest will be Saturday, June 27, called Rhythm and Booms, and fireworks are displays of chemical reactions. Prior to the fireworks show, Professor Shakhashiri will present demonstrations and discuss the science of fireworks at the Memorial Union Terrace, from which spectators can see the fireworks display across Lake Mendota from the Union. 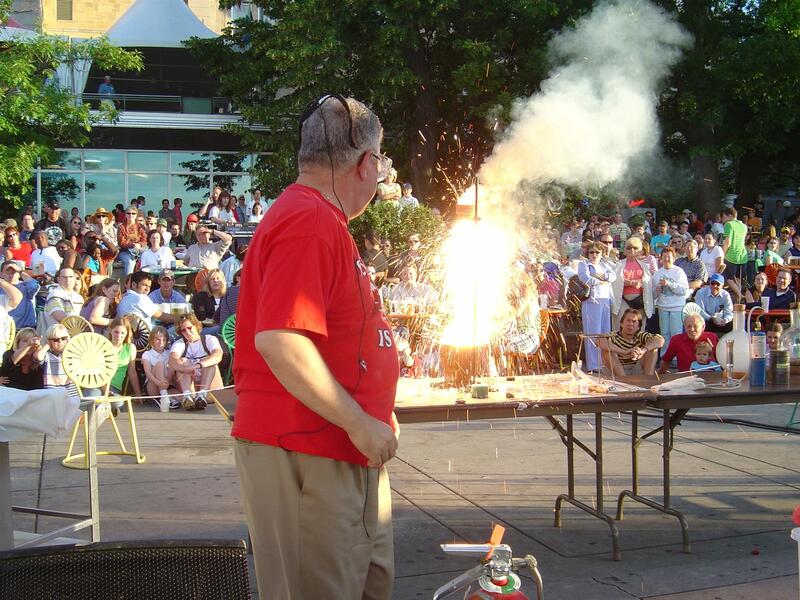 Click here for a photo from a previous Science of Fireworks presentation, which shows a thermite reaction, and here for a photo from this presentation, which shows what happens when you ignite a gas-filled balloon. Professor Shakhashiri said fireworks generate three forms of energy -- sound, heat and light, with the colors of the light produced by heating metal salts. Each element emits a characteristic color when excited by heat, and preparing fireworks shows is both an art and a science. For example, strontium and lithium, in salts like carbonates or chlorides, produce a red color. Calcium produces orange, sodium makes yellow, barium makes green, copper makes blue and purple is created by a mixture of strontium or lithium and copper (blue plus red is seen as purple). Silvery effects are created by burning metals such as aluminum, titanium or magnesium. Professor Shakhashiri emphasized that safety should be paramount. He said fireworks should be set off by professionals with the rest of us sitting at a safe distance and watching. He also noted that the fireworks are really a celebration of American independence. The official name of the holiday is Independence Day, not the Fourth of July, and he reminded listeners of what it's really about, urging them to read the Declaration of Independence. A caller who identified himself as working in the fireworks industry for 25 years said he always listens to Professor Shakhashiri, uses the Science is Fun Web site and thanked Professor Shakhashiri for his work. The caller urged Professor Shakhashiri to join the Pyrotechnics Guild International which is holding its next convention in Wisconsin. The caller asked about a report in the London Times about a study from Edinburgh University. In a survey of scientists, one out of seven said they knew of another scientist who fudged data, and that almost half engaged in questionable practices (only a few admitted to cheating themselves). The caller said people should be skeptical about what scientists say. Professor Shakhashiri thanked the caller for the compliments and the information about fireworks. There's an article about fireworks on this web site under "Chemical of the Week" and Professor Shakhashiri said if it's mistaken, he wants to learn about it. As for scientific ethics, Professor Shakhashiri said ethics should be at the highest level and that it's unconscionable to fake data or misrepresent results. Being skeptical is the way we make advances in science, he said, and findings must be validated. Another caller said the description of the study seemed to indicate that it was the opinion of scientists that others cheat, but opinions are not hard data. The study seemed to paint scientists as less than honest, but he said that conclusion is not valid from the study. Professor Shakhashiri said he would have to read the report to find out what it actually says, but noted that there have been well-publicized cases of fraud in science. These were publicized because they were discovered by other scientists, and he said science is good at catching misbehavior through peer review. A caller answered the question of what causes the seasons. He said the tilt of the earth's axis means that more sunlight hits the hemisphere that is tilted toward the sun. Professor Shakhashiri said the caller was correct. For more on this topic, see the June 22nd entry here. Professor Shakhashiri said he asked the question because of a study that's been going on for more than 20 years asking people who attend graduation ceremonies at Harvard University for an explanation of the seasons. The question is asked of faculty and alumni as well as graduating seniors, and the results are disappointing. In one year, 21 of 23 people asked could not furnish an adequate answer. Here is a link to the project related to this topic. "The sun rises due east and sets due west on only two days a year: the spring equinox (around March 20) and the autumn equinox (around September 20). During the remainder of the year, the point along the horizon of the sun's rising and setting moves north of the east-west line in the spring and summer and south of it during the autumn and winter. In Madison, for example, on the day of the summer solstice, the sun rises nearly 34 degrees north of due east, and it will set that far north of due west on that day. Anytime that the sun has an "azimuth" (location measured along the horizon, like a compass bearing) north of the east-west line, it will illuminate a north-facing wall. This will be most noticeable around the time of the summer solstice (around June 21). So the ascending (morning) sun will illuminate a north-facing wall until it rises far enough to reach due east, at which point the wall falls into shadow. In the afternoon, after the descending (afternoon) sun reaches due west, sunlight will again illuminate the wall. The period of morning and evening illumination of the north-facing wall will decrease gradually, then disappear at the autumnal equinox in September, not to reappear until the spring equinox in March. All this discussion assumes a perfectly flat eastern and western horizon, which is rarely the case except at sea. But unless the north-facing wall we are discussing is located in a deep valley, it will probably receive morning or evening sunlight for some weeks around the summer solstice." A caller asked whether science is going in a better direction under President Obama. Professor Shakhashiri said there's a big difference and he's overwhelmed by the freshness of what the President is saying. But he added that while Presidential statements are important, the real hard work must be done by citizens. Professor Shakhashiri said the trajectory is good and the different tone from Washington is good, but it's too early to tell whether the result will be better. He noted a report from the National Research Council released June 15 which said that 10 percent of the energy used in the U.S. will be from renewable sources by 2020. If that happens, he said, it will be a sign that things are better. A caller asked what evolutionary advantage butterflies get from their bright colors. Professor Shakhashiri said that's a good question. An explanation will be posted here at a later date. Larry asked about President Obama's call for a commitment by students to spend one more year in school. Larry noted that 7 of 10 high school students now graduate in four years. Professor Shakhashiri said it's a desirable goal and can be realistic if we work on it. He noted that in 1996, 66 percent of students graduated from high school in four years in the U.S., while the percentage in Wisconsin was 77 percent. In 2006, it was 77 percent nationally and 82 percent in Wisconsin (one of the highest states). He said President Obama's call for everyone to complete four years of college is realistic since we have the schools, and more graduates are needed since society is so dependent on science and technology. He urged Congress and the states to make it a national goal to increase college graduation and provide money to accomplish it. A listener sent a question by e mail: What do you think of cold fusion? Professor Shakhashiri said it has not been shown to be real. Since the first claim more than 20 years ago of attaining cold fusion in the laboratory, efforts to replicate it have failed. The sun's energy comes from fusion of hydrogen into helium, uniting the nuclei of hydrogen atoms, but the sun does it at tremendous temperatures and pressures. The claim that it has been accomplished at room temperature is unproven. Professor Shakhashiri says he's open minded on the subject -- someone may prove it's possible and, if so, it would be of tremendous benefit, providing clean and almost unlimited energy. Larry began by remarking that he taught his last class of the semester yesterday, May 6 (Larry is a Professor of Communication Arts in the College of Agriculture and Life Sciences). Professor Shakhashiri said he always has mixed feelings about the end of a semester, because it’s the last time he sees each class as a group, though he often runs into former students in his travels around the globe. He reported that some students this year are concerned about the job market, some will do public service and some will take time off before joining the job market. Professor Shakhashiri reminded everyone, parents, students and teachers, that learning does not happen only in the classroom. We learn all the time and he urged everyone to do something over the summer, some reading, going to zoos, gardens or arboretums or enjoying music–there are many educational and recreational activities that we learn from. Larry said he got a blog from a former student who graduated last year. The student is now bicycling from South Africa to Cairo. Professor Shakhashiri noted that he has taught approximately 25,000 students in his 39 years of teaching at the UW-Madison, including doctors who have treated him as a patient. There are many other notable alumni of Shakhashiri classes including Patricia McConnell, an animal psychologist who has her own program on National Public Radio, “Calling All Pets”, with Larry as co-host, and Phil Pellitteri, a nationally known expert on insects who often appears on Larry’s call-in program. Professor Shakhashiri announced that he is planning 40 public events, starting June first, to commemorate his 40th year as a faculty at the UW-Madison. Larry asked about changes over the years in students’ attitudes and motivations. Professor Shakhashiri noted that there have been many changes in society, including the development of new technology. Students today use a lot of new technology including cell phones, I pods, and instant text messaging, but Professor Shakhashiri is not sure how useful this is for education. He said many of the messages are not in good English and he’s concerned about the quality of what is communicated. Students today are bright and eager, he continued, but seem less engaged in political activities than in previous years. He said students should try to find ways to focus on issues beyond using technological toys (which are the result of a lot of scientific and engineering research) because it’s up to everyone to use technology to enhance the quality of life and benefit society. Larry noted that President Obama has promised to restore science to its rightful place in government and society. Professor Shakhashiri welcomes that promise, calling it the kind of political leadership that will benefit the country, setting a tone urging everyone, not just scientists and politicians, to put science in its proper role, with open and free inquiry and academic freedom. Science should be respected and the results put to good use, he continued, on the two most important issues facing society today, energy and human rights. Concerning energy, Professor Shakhashiri pointed out that with a growing world population, energy demands are huge, and have resulted in massive production of greenhouse gases, with political and social ramifications. Concerning human rights, Professor Shakhashiri said the quality of life in poor societies is a great concern, and that everyone deserves a legal and political framework to be able to enjoy the benefits of technology. Professor Shakhashiri said science and religion are the two strongest forces in the world and are not really at odds, as some believe. While there’s conflict, some religiously based, over issues like abortion, embryonic stem cell research and end of life issues, the interests of science and religion overlap. Professor Shakhashiri does not expect full agreement between science and religion, but called for respectful conversations on issues, since both sides have the same goal of making society sustainable and fair. A caller said that science has a responsibility to reveal all the costs of new technology including societal costs. Professor Shakhashiri agreed, saying that everyone involved has a duty to point out the huge benefits that can accrue from science and technology as well as the potential hazards. Another caller said decisions should be made on the basis of hard data, noting that anyone can put anything on the web and that important decisions are sometimes made that are contrary to the best available information. Professor Shakhashiri agreed that it’s important to use data properly, but also noted that not all societal problems can be solved in the way we do science. Another caller deplored a recent decision by the University of Wisconsin-Madison to provide late-term abortions at a University clinic. She said, “Killing unborn babies breaks my heart.” Professor Shakhashiri thanked the caller for raising the point and called for a healthy dialogue on the issue. Issues like abortion have not been discussed as well as they should be, he said, and there are strong emotions on all sides. He called for discussions in which people are respected even if they do not respect each other’s positions. An e mailer asked about mercury in some types of lighting fixtures, asking what happens to the mercury when they break. Does it do into the atmosphere or stay in the pieces? Noting that mercury vapor is poisonous, he referred the e mailer to the Chemical of the Week feature on this web site, which includes an article on Mercury. e-mailer to a brand new Chemical of the Week article on Water. A caller who identified herself as a math teacher said education should try to create meaningfulness and connections as an answer to those who question the value of teaching mathematics, saying they will never use it. Professor Shakhashiri said it’s true that mathematics is the language of science, but added that writing and reading skills are also important to understand science. Everyone should learn some math in school, he continued, making the concepts clear and showing how it’s used. Not everyone can make practical use of higher math, he said, but can learn its connections to applications. Another caller said science is usually taught for its practicality and usefulness, not for its beauty. She noted that English literature is not taught as a practical subject, but attempts to use great ideas to experience beauty. Professor Shakhashiri said he likes that observation. In some places, science it taught from an entirely practical perspective, he agreed, but he added that sharing the joy of doing science and the beauty of appreciating science is a liberal art which deals with deep questions that don’t immediately connect to a practical application. Doing research into the origins of life may not have immediate practical application, he continued, but can tell us a lot about ourselves and help answer deep philosophical questions. And, he continued, there’s no way to tell what will result from basic research. For example, during the development of radar, no one could have anticipated that it would lead to magnetic resonance imaging machines that diagnose disease. Good teachers instill an appreciation of science, he concluded. Filling in for Larry Meiller, Jim Packard asked about how the federal economic stimulus money from the American Recovery and Reinvestment Act will affect science. The National Institutes of Health will receive 10 billion dollars and other agencies will receive billions as well. Professor Shakhashiri said this is a very excellent situation for the science community since many good research proposals have already been received by federal agencies. Specifically, the National Science Foundation will get an additional three billion dollars, two billion of which will fund proposals which the agency has already received, peer-reviewed and approved. Scientists realize that this additional money is a one-time deal, Professor Shakhashiri said, and much of the money will go toward research on new technology such as alternative energy. He warned that research takes a long time and practical applications might not be found immediately, but he also noted that the stimulus money will create jobs. The remaining one billion dollars for NSF will provide new equipment and instruments, and improvements in infrastructure, including renovating and replacing buildings, many of which are old. This will create jobs, including blue collar jobs, making the instruments and in new construction. Professor Shakhashiri said he’s optimistic that the science community will rise to the occasion. As far as overall economic recovery is concerned, he said, “As a scientist, I take a wait-and-see attitude.” He noted that everyone, in business and science and at all levels of government must cooperate to promote recovery. Jim asked about prospects for Wisconsin scientists and institutions to get recovery money. Professor Shakhashiri said it’s very likely that Wisconsin will get considerable money since there are many proposals from Wisconsin scientists already awaiting funding by government agencies. Jim asked about Professor Shakhashiri’s article in the current edition of Wisconsin People and Ideas, the magazine of the Wisconsin Academy of Science, Arts and Letters, which contains several specific proposals for improving science education. The article notes the huge gap worldwide between rich and poor, with at least one billion people currently living on less than one dollar a day. Professor Shakhashiri called the gap “astonishing”, asking, “How can we as custodians of technological advances tolerate having so many others living in such poverty?” He called the gap both heartbreaking and highly detrimental to preserving the environment worldwide. Our knowledge and technology must be shared worldwide, he said, to make everyone part of a successful society with better education and less disease. Jim asked if the poorest people are refugees. Professor Shakhashiri said most are not; they are living in their home countries where poverty impairs productivity because people have no access to clean water or the information necessary to prevent the spread of disease. He called the situation “dire” and added that we in the wealthy world can improve the lives of those in poverty as well as our own lives. The article also deals with moral issues, such as the use of technology to create powerful new weapons and environmental destruction. Professor Shakhashiri again promoted the concept of science literacy for everyone. This is not necessarily expertise in any particular area of science, but an appreciation of science, what it can do, what it can’t do, and the potential risks. Science literacy is necessary for a democratic society, he continued, so that citizens are enabled to make informed choices and reject scams and quackery. Education is the key in all societies, he continued, to give people the skills to succeed in all types of endeavors. Education occurs not only in schools, he said, but is always going on in all settings if people develop their inborn curiosity. A caller asked about diet, asserting that Americans have become addicted to high fructose corn syrup and other high-sugar, high-calorie foods, leading to an epidemic of obesity and type two diabetes. Professor Shakhashiri said nutritional science has made many advances but that most of us do not take advantage of the knowledge because we are not well enough educated. He noted that Wisconsin is famous for its cultural preference for beer, brats (bratwurst sausages, for those who are not familiar with American Midwestern culture) and brandy (Wisconsin leads the nation in per-capita brandy consumption). He called these the three Bs and said that if citizens learned more and accepted scientific findings, this might make a dent in the problems of obesity and drug abuse. For general information about nutrition please visit Susan Nitzke’s Web site. For information about fructose and diabetes please visit this link. A caller said that as long as money controls scientific research, the result will be new weapons and quick profits. The caller said the current economic system amounts to “phoney capitalism, with socialism for the corporations and a dog-eat-dog world for everyone else”, and said scientists should stop going with the flow and put people above money. Professor Shakhashiri noted, as he often does, that advances in science and technology can be accompanied by detrimental consequences. He said most advances are beneficial and that most scientists are not motivated primarily by money, but because they like to ask questions and explore. For some, this is an end in itself, but others hope to benefit society. It’s up to everyone to help make the decisions on how technology is used, he continued, so it’s important for citizens to be educated and informed. A caller asserted that a plan by Wisconsin Energy Corporation to build a new three billion dollar coal-fired power plant in Southeastern Wisconsin is an example of the public being bamboozled. The caller said the plant is not needed because energy could be stored during times when less electricity is being used and then used during peak times. He suggested using off-peak electricity to make ice for cooling buildings the next day or storing compressed air in unused mines and caves to run turbines when needed. Professor Shakhashiri said one of the joys of appearing on Wisconsin Public Radio is to hear the variety of views expressed by listeners. He said such decisions should involve everyone because they are not just scientific decisions but also social and economic. He added that science must be in the forefront in decision making and that energy is one of the most important current issues. The Industrial Revolution resulted in massive use of fossil fuels. Now we know more because we’ve done more research, he continued, and these are important issues. For information about storing energy please visit this link. Jim asked about some specific proposals in Professor Shakhashiri’s article, including more teachers for the Milwaukee school system and “Science and Engineering on the Road.” Like many big city school systems, Milwaukee has a high dropout rate and many students who do poorly on assessments. In his article, Professor Shakhashiri proposes a system of full scholarships for students in teacher training at all Wisconsin colleges. In exchange, they would work for at least five years in the Milwaukee school system upon graduation, and he hopes for 200 new teachers a year under the program. Professor Shakhashiri said this is not intended to be a criticism of current teachers in Milwaukee — “my hat is off to them”, he said — but a new infusion of talent is needed. He also proposes a continuing development program for teachers after graduation, and called for empowering teachers and putting them in an environment where they can succeed and stay. Another initiative Professor Shakhashiri proposes, Science on the Road, would involve 25 science vans, equipped with the latest equipment and learning tools, which would travel around the state. He foresees the vans being donated by the private sector and colleges and universities providing the staff, and says he would be glad to talk with anyone about the details of starting the program. This is not a new concept — more limited programs are offered now in several places — but Professor Shakhashiri sees Science and Engineering on the Road as being much more extensive, with vans staying as long as a week in each location, bringing equipment and opportunities which many school systems can’t afford. A caller said his daughter is a former student of Professor Shakhashiri’s, now studying for a master’s degree in teaching and aiming for a career as a high school chemistry teacher. The caller asked whether it would be worthwhile for her to go on for a doctorate. Professor Shakhashiri said he’s always happy to hear from former students and their parents — it’s one of the rewards of teaching. He told the caller that getting a doctorate would be helpful and that every teacher should have some form of continuing education. He said the research required for a doctorate helps students learn more about what to teach and how to teach, and helps develop a more inquisitive attitude. As for career opportunities, he urged the student to contact the career placement office at her school. Another caller said teachers are being discouraged from getting advanced degrees because school boards don’t want to pay the scale required for advanced degrees. Identifying himself as a retired professor now doing substitute teaching, the caller said advanced degrees would be fine for going into school administration, but that a teacher with an advanced degree might be out of a job. Professor Shakhashiri said some school boards appreciate advanced degrees and are willing to pay for them. He agreed that teachers in general are not well paid and said communities should reward them financially and with the respect due to important members of the community. Professor Shakhashiri also commended the caller for continuing to contribute to the community after retirement. He said retirees have a lot to offer and urged others to share their knowledge and talent. Jim asked about upcoming events and Professor Shakhashiri mentioned the March 27 lecture by former presidential advisor Neal Lane and Science Expeditions on April 4. On April 9 the Science, Religion, and Ethics Program of WISL is sponsoring a lecture on Science & Islam. Larry began by asking Professor Shakhashiri what we can expect from the new Obama administration, noting that President Obama has promised to restore science to its rightful place and has also called for transforming colleges and universities to meet the nation’s challenges. Professor Shakhashiri said his reaction can be summed up in one word--fabulous. “As a citizen, as a scientist, and as a teacher, I say fabulous,” he continued. Obama is striking a note of true leadership, he said, noting that science and technology are the engines that drive the economy. Professor Shakhashiri said the economy is in trouble due to what we as a society have done with them. Obama’s call should be heeded by everyone, he continued, and he asked listeners how they feel. Professor Shakhashiri said the immediate and long term welfare of society are at stake, not only in the U.S., but in the entire world. What we do with technology is a measure of our values, he continued, warning that science and technology can have adverse effects depending on how they are used. For example, the industrial revolution did a lot of good but also had many negative consequences, including pollution. Larry asked if President Obama can pull it off (restoring science to its rightful place). “By himself, of course not,” Professor Shakhashiri replied, “he will need the help of many others.” The current economic problems are human problems, he continued, the result of the failure of many people to act responsibly. Taking responsibility requires action and learning from mistakes, he said. Larry noted that Obama has already appointed several scientists to government posts, including Steven Chu to head the Energy Department, Jane Lubchenko to the Oceanic and Atmospheric Agency, and John Holdren as science advisor. Professor Shakhashiri said he knows some of the appointees and they are outstanding scientists who are also responsible citizens and open minded about issues. He continued, “The question is whether they can be successful in the political arena.” Professor Shakhashiri expects the appointees to bring clear thinking to their posts, but it remains to be seen how successful they will be in the political arena. Larry asked what the administration should do about science education..Professor Shakhashiri said he’s optimistic that the new administration will address the quality of school at all levels and put science and technology in the right place, recognizing their limitations as well as benefits. One possible initiative: revisiting the idea of national science and math standards. Professor Shakhashiri noted that Wisconsin Rep. David Obey, chair of the House Appropriations Committee, has introduced a very large stimulus package aimed partly at transforming the economy through science and technology education. The bill, if approved, would provide an additional three billion dollars for the National Science Foundation on top of NSF’s current budget of $ 6 billion, with two billion for expanding employment opportunities in science and engineering to create new jobs and deal with energy and environmental problems. That will require training more people to fill the jobs. A caller asked about making hydrogen for fuel, noting that for more than 100 years scientists have been making hydrogen by reacting sulfuric acid with iron, and wondered if that would a be feasible way of making hydrogen. Professor Shakhashiri said that is a classic way of making hydrogen, but that any method of making hydrogen in large quantities must be economically feasible and relatively free of pollution. The reaction between iron and sulfuric acid is not economically viable. Professor Shakhashiri noted that hydrogen has one great advantage as a fuel–the only by-product of burning it is water–and there are many research projects under way around the world to develop a hydrogen economy. A caller asked about science diplomacy and whether there would be specific international projects. Professor Shakhashiri said that if the stimulus bill is passed in current form, there would be wide latitude in using the NSF money. The three billion, for the most part, is not earmarked and could be used for many things. In practice it would be used to fund proposals received from scientists and engineers. Professor Shakhashiri noted that NSF has an office and programs for international activities and the Secretary of State has a science advisor. Professor Shakhashiri said he knows the last three science advisors to the State Department, and they did the best they could. Secretary Clinton has not yet appointed a science advisor (she was just confirmed by the Senate earlier in the day), but Professor Shakhashiri expressed confidence that science and technology will be a vehicle to improve international relations. A caller identifying himself as a retired science teacher noted that in the late 1950s and 1960s, NSF funded continuing education for teachers. The caller also asked why we didn’t do more years ago to harness alternative energy. Professor Shakhashiri said the launch of the Sputnik satellite in 1957 by the Soviet Union was not only a shock to Americans who were confident of their supremacy in science, it was perceived as a military threat, and that resulted in improving the training of science and math teachers. Professor Shakhashiri said we seem to need a threat to stimulate action and most Americans see the economic downturn as a crisis, so he’s optimistic that something similar will happen now. He also noted that the expenditures on science and technology in the 1950s and 60s triggered breathtaking advances, and he hopes for the same today, but added a caution that the money must be spent responsibly with the public knowing how it’s used. Larry noted that he had a National Science Foundation fellowship which helped with his education. A caller asked if hydrogen fueled vehicles, with water as the only by-product, would create a hazard by freezing on roads. Professor Shakhashiri said it would not because the amount of water would be relatively small. He noted that burning hydrocarbon fuel also creates water as a by-product. Water vapor is a greenhouse gas, he said, but the main goal should be reducing the production of carbon dioxide, and water vapor is not the main problem. A caller e mailed a question about superconductivity. 10 years ago, he said, news stories claimed superconducting materials would save the world. Professor Shakhashiri said superconducting materials are still very promising and are in use in very limited circumstances, namely mag-lev trains which are lifted by electromagnets and do not touch the rails. But superconducting materials have not penetrated society in general and the speed with which they are adopted depends in part on how we travel. We are conditioned to rely on cars, Professor Shakhashiri said, and as individuals and as a society we must carefully examine our style of life to find comfortable ways, and perhaps not so comfortable ways, to reduce greenhouse gases. The next caller, who identified himself as a retired surgeon and also a pastor and a former science teacher, said he was trained as a surgeon by operating on animals. He said the subjects were dogs and other animals which would have been euthanized, and that they got tender care. “The care they get is not the gruesome thing people think,” he said. The caller also identified himself as a Republican, but said he supports Obama. The caller said he was a teacher at the time of Sputnik and got money to build a better science department. The caller also said that science can foster international cooperation and unity. The caller said he was in LaPaz, Bolivia when the U.S. sent its first person into space, and he said there was a great celebration and support of the U.S. He also said he was in China, at the Great Wall, when China launched its first person into space. He said he was approached by a group of Chinese soldiers who wanted nothing more than to have their picture taken with an American to celebrate the achievement. Professor Shakhashiri thanked the caller and noted that scientific accomplishments have no national boundaries (he also noted that pollution has no national boundaries). He quoted the late physicist Richard Feynman:"The world looks so different after learning science. For example, trees are made of air, primarily. When they are burned, they go back to air, and in the flaming heat is released the flaming heat of the sun which was bound in to convert the air into tree ? These things are beautiful things, and the content of science is wonderfully full of them. They are very inspiring, and they can be used to inspire others." An e mail correspondent asked how to help a ten year old pursue scientific ideas. One of the ideas was using lightening rods to collect electricity and store it. The writer wondered if the idea was feasible and asked about finding more information. Professor Shakhashiri said the message was a great testament to the curiosity of children and the wonderful support they can get from adults. He also noted that Benjamin Franklin carried out an experiment with lightening, proving that it is electricity. Professor Shakhashiri recommended a book, “The Electric Universe” and referred the writer to other recommended books for both children and adults that can be found on this web site.